Usher the crisp, winter feel of freshly fallen snow into your home with the Flocked White Pine Christmas Tree. A luxurious, whimsical twist on the traditional tree, this XMAS tree is a testament to the delights and joys of Christmas. Its professionally strung lights have the wires tucked and hidden for a more natural appeal, while the needles at the base of the tree help create a down swept look. This shining, pre-lit artificial pine tree truly lights up the room and creates a warm ambiance that will bring the family together. Colorful ornaments enhance its gleaming purity, while its high-quality PVC needle branches add realistic texture and fullness to its appeal. 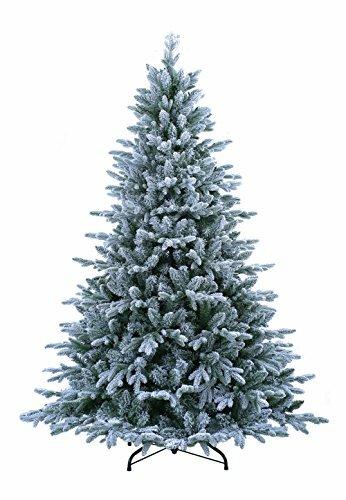 Bring out the magic of the winter season with this beautiful Flocked White Pine Artificial Christmas Tree. Made of 100% high-quality PE flame-proof material.Standing at 7.5 feet, this hinged Christmas tree is an eye-catching addition to any room during the holidays. Prelit with worry-Free UL - approved lights, professionally strung lights to hide wires. With massive 1452 tips and a foldable metal stand.Just slot every part together and arrange branches to your taste.